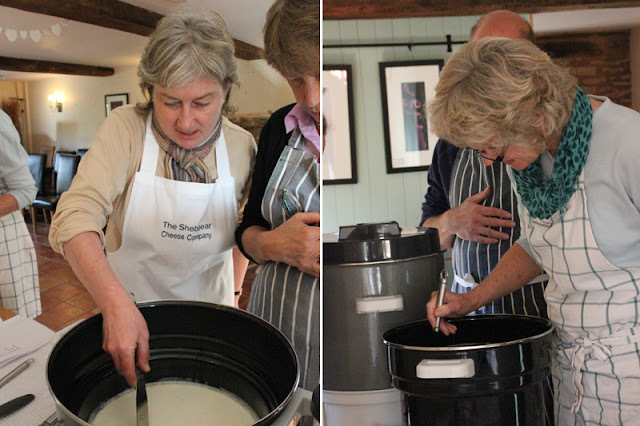 Last Saturday saw the 2nd cheese making workshop at Clavelshay Barn led by Sarah & Chris Styles-Power of Shebbear Cheese. Last time Sarah taught the class alone, this time she brought her husband Chris to help keep the class in check. Sarah and Chris are a great double act – the Morecombe & Wise of the cheese making world and soon had everyone at ease and hands on in the making process. Despite the good humour, much was learnt and taken in by our willing students with Annie & Sarah keen to practise at home making their own Classey Valley cheese - can’t wait to try that. All took home a cheese they had made – a soft feta type and a semi-soft one which needs to mature in the fridge before eating. Stephen Barrett who was taking part in the course , runs a restaurant in Plymouth (Bistro One)and is also a journalist specialising in food and wine. He is writing an article on the cheese making workshop for the Western Morning News and it should appear within the next few weeks. Photographer Richard Austin took endless trouble taking shots for the article. Everyone so enjoyed the day that they want another one – we will probably have one in May , when we will learn how to make a blue cheese. Thank you to everyone who took part , with special thanks of course to Sarah & Chris . 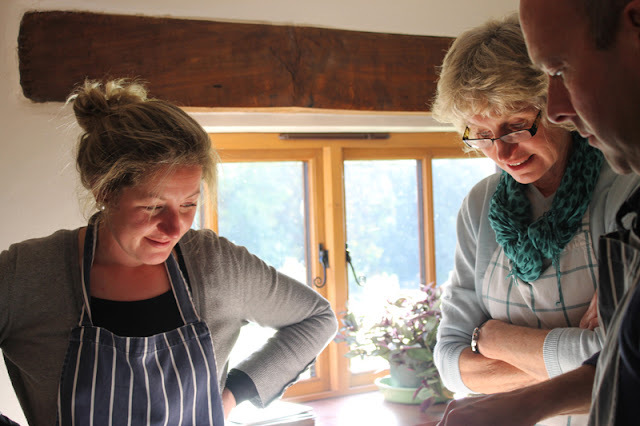 We love our local producers, suppliers and Good Food Workshop instructors here at Clavelshay Barn. We love spending time with these amazing people who do what they love, and their passion for good food and crafting a more sustainable and tasty world is constant source of inspiration for us. We also think most of them have some pretty interesting stories too, so we thought we would share some of our favorites here in an ongoing series. Starting with our lovely Cheese Making Workshop instructor Sarah Styles-Power from The Shebbear Cheese Company. 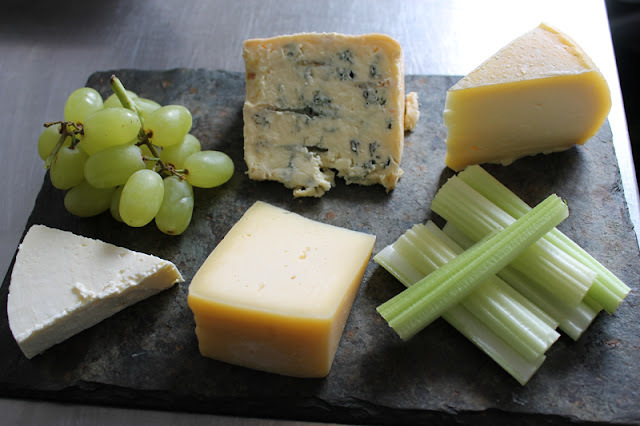 Sarah runs her little local cheese business with her husband Chris from their home in Devon and makes moreish hand-made cheeses to traditional recipes with quirky names like Old Sheb, Forda, Bramley Barton and Forda Blue which she now sells at local farmers markets. Four years ago we had a swarm of bees in the wall of a barn. We phoned the local bee keepers association and they sent a couple of their members out to collect the bees. This involved 3 visits and whilst chatting to one of them I discovered that she had a pony and trap – something I was interested in as I had a horse broken to drive but had never been able to afford lessons or a harness and cart! She offered to take me out in hers and it was whilst we were driving around the countryside that we discovered both of us had always wanted to make cheese. She had bought some second hand molds and a book and I had a book! The plan was to buy milk from her neighbour, a dairy farmer and I was to order cultures and rennet. Unfortunately her neighbour wouldn’t sell his milk so we had to use supermarket milk. There was no plan on the day we just opened the book and decided to make a Derby cheese! 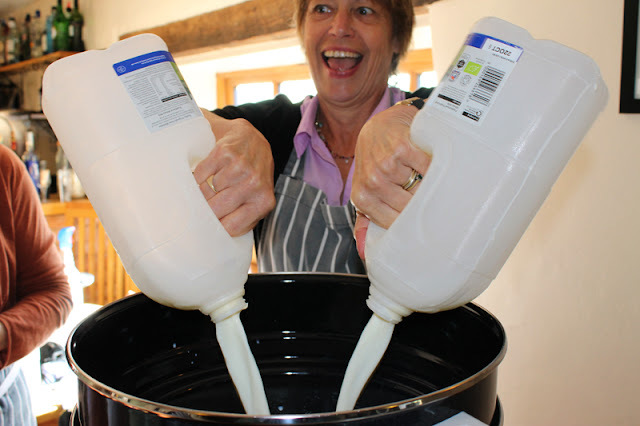 Her largest saucepan wasn’t big enough so we ended up with a 15L plastic bucket that had stored her bee sugar! This didn’t fit properly into the water filled roasting tin but somehow we ended up with curds and whey. We used one of the molds she had bought and then set about pressing it in my cider press using a saucer and wood as a form for the top of the mold. We then pressed it to death. Surprisingly we ended up with an edible cheese. Using the left over whey we made ricotta and then lastly made a soft cheese which had to be left for 24 hours to rennet in a warm place. Despite being left on the side of her aga for some hours before her husband came home and pointed out how hot it was, we ended up with a soft cheese that tasted ok.
A few weeks later we had another cheesemaking day and made a cheddar, ricotta and soft cheese. 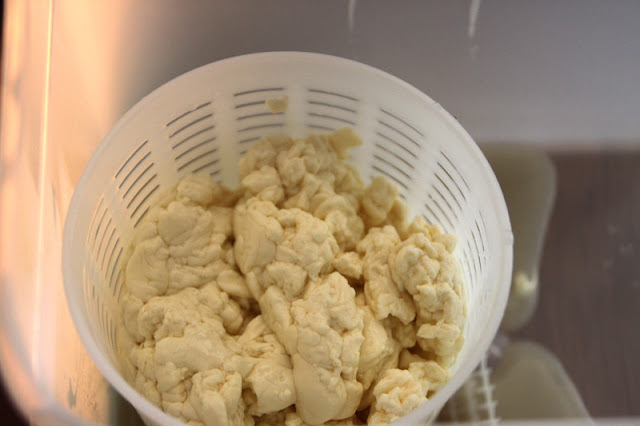 By this time, I was hooked and decided to buy some cheesemaking supplies and make some cheese at home. The beekeeper was busy studying for exams and didn’t want to come over to mine to make cheese so I gradually worked my way through the cheeses in the book. Friends started to ask me to make cheese as presents for them and then I attended a Farmers Market in the village and actually sold cheese to customers! This all happened over 12 months and I was still using supermarket milk which was proving quite expensive. I then found a local farmer who made ice cream with his milk and was prepared (and allowed by DEFRA) to sell milk to me. So for the last 3 years I have been making cheese with this milk and gradually increasing output, and have started selling my cheese at Farmers Markets and Food Fairs. I find cheesemaking very therapeutic and despite being time-consuming I’ve never got fed up with it, in fact I love being a cheese maker and can’t imagine doing anything else now. I just wish I’d discovered this magical process years ago. I’ve got a lot to thank the bees for! 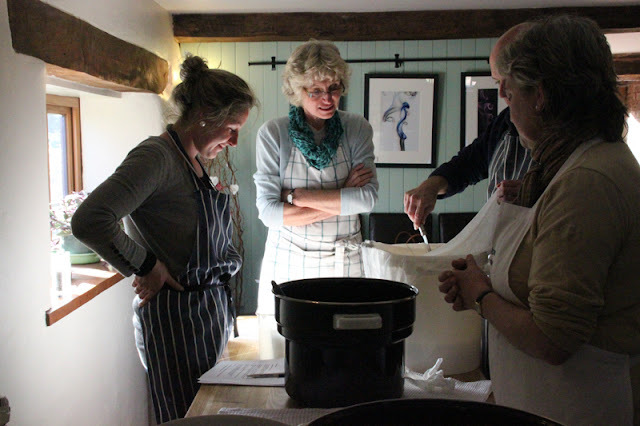 Sarah will be showing us how to make some of her delicious cheeses at our Cheese Making Workshop on Saturday 23rd February, so if you love cheese, then come and learn how to make it! You can find out more about the workshop here and call Sue to book your spot on 01278 662629. Call Sue on 01278 662629 to find out more and book your spot. We are excited to announce our 2nd Cheese Making Workshop with the very lovely Sarah from The Shebbear Cheese Company in Devon. The 1st workshop we had was extremely fun, very relaxing and informative, and we can't wait for the next one. 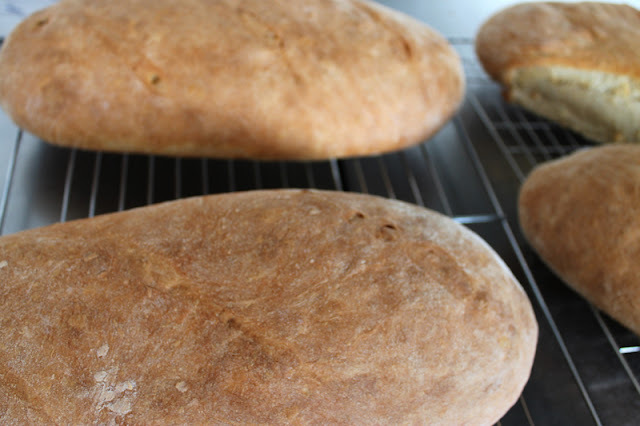 So if you love cheese, then come and learn how to make it! 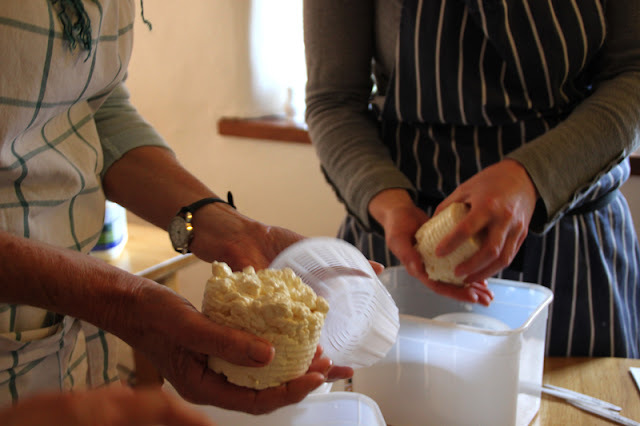 You will be learning the art of making your own semi-soft and feta type handmade cheese using traditional methods. Sarah will be guiding you through the cheesemaking process, you will learn the use of cultures, rennets, draining, molding, salting and aging your cheese using everyday kitchen equipment. At the end of the day students get to take their cheeses home with them and most importantly, they will be equipped with the knowledge and skill to re-create these cheeses at home. 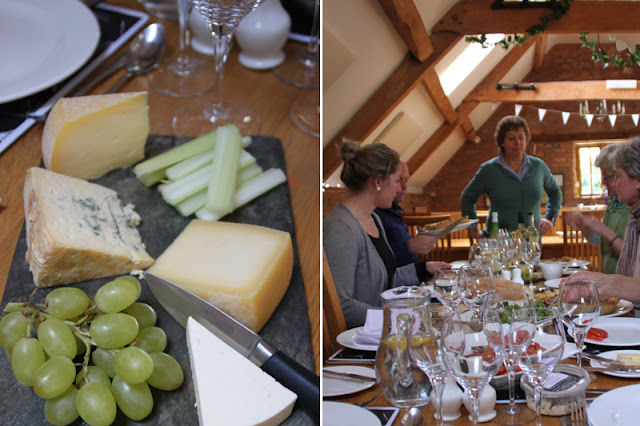 Clavelshay Barn will also be serving a scrumptious lunch, including some of Sarah’s very own handmade cheeses and local seasonal ingredients from the Somerset Region. If you are struggling for Christmas gift ideas, why not give a Good Food Workshop gift voucher as a gift? We offer gift vouchers which will allow the recipient to choose a Workshop that best suits their schedule. We are continually inspired by the wealth of local producers here in the South West and Sarah from Shebbear Cheese is one of our favourites. Sarah has been making cheese for many years now, and her passion for the cheese making process and using natural local ingredients is inspiring and completely contagious. I’ve attended many workshops over the years and made countless things from scratch. But one thing I had never tried my hand at before was cheese-making. It had always seemed a little bit too complicated a process for me. But I do love eating cheese. So when the opportunity came to take part in Sarah's cheese making course that Sue and I organised at Clavelsahy, I was pretty excited. The day was a good mix of relaxed and busy – with plenty of time for questions and reviewing the process, but no hanging about aimlessly. At 10am we gathered over coffee and biscuits for an introduction and then got straight into learning the art of making our own semi-soft and feta type handmade cheese using traditional methods. Starting with the basic cheese making steps. We learnt how to warm the milk, inoculate the milk with lactic bacteria and ripen the milk. 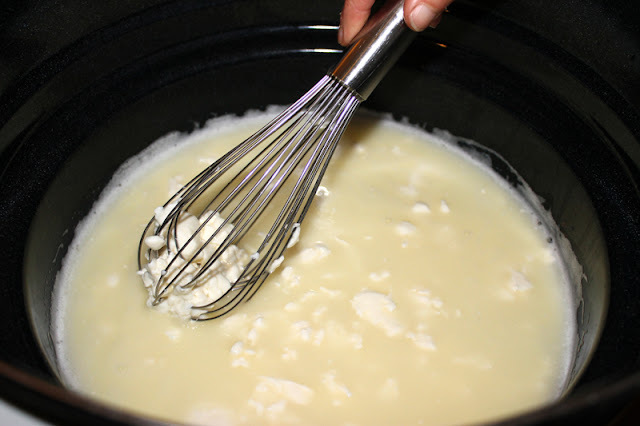 Add the coagulant to the milk and allowed it to set until it forms a solid curd. 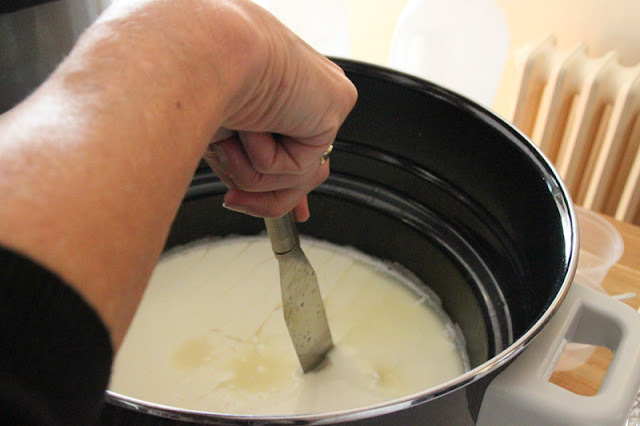 Once the cheese had set into a solid curd, we then cut it up, let it set for about 10 minutes. Once it had set we drained it, molded it and popped it on a ripening mat in a plastic container. 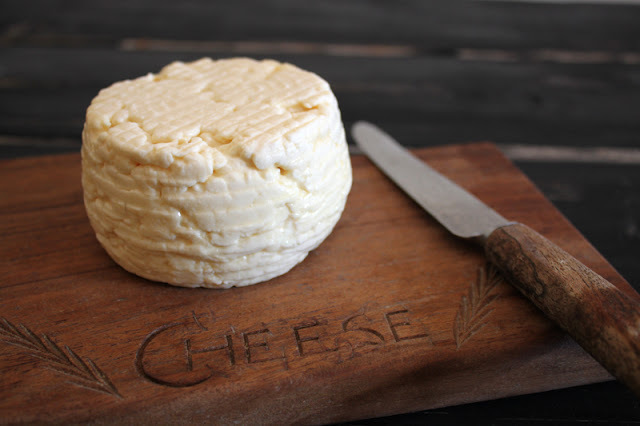 And voila, our soft cheese was made. It was actually much easier than I thought. A quick break for lunch of warm home-made bread and then quiches and salad made by the multi talented Sue, followed by an incredibly delicious range of Sarah's own handmade cheeses. Then it was back to the 2nd round of cheese making, this time the feta. We followed the same steps for the semi-soft cheese, and before we knew it the feta was made and ready to take home with us. Sarah gave us all containers, draining mats, salt to make the brine for the feta at home, notes on the ripening steps for both cheeses, and most importantly, we were equipped with the knowledge and skills to re-create these cheeses at home. I loved that the class was such a friendly, easy intro to cheese-making, and surprisingly the whole process of traditional cheese making is very therapeutic. Thank you so much Sarah, we had a brilliant time, and can't wait for the next workshop. 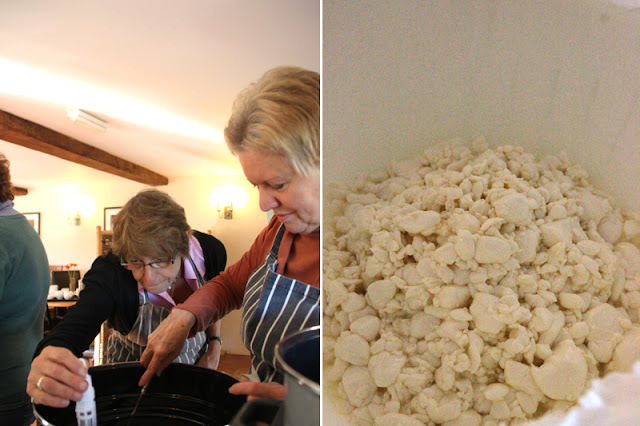 If you are interested in attending the next cheese making workshop in the spring of 2013 (details coming soon) just call Sue on 01278 662629. Oh yes, one final thought. 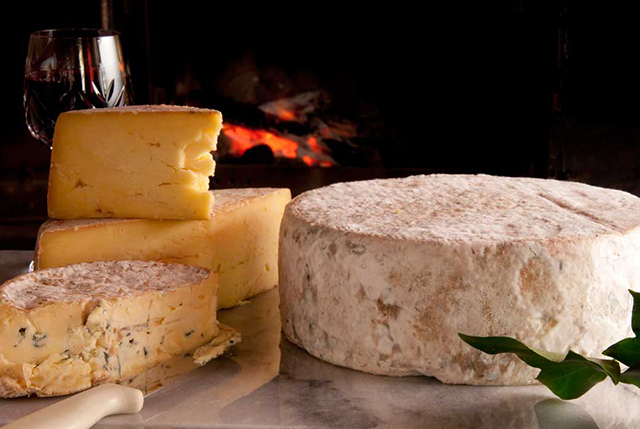 You can taste some delicious locally made cheese yourselves by contacting Sarah herself here.